In the spring of 1917, the question of training soldiers disabled in the First World War arose. As a result of a successful pilot scheme, work started in 1918 to build a special factory in Coombe Road Brighton. The factory was known as the Bernard Oppenheimer Diamond Works, and was the backbone of a large undertaking, where the war disabled were trained to polish diamonds. The factory was one of the largest in the Brighton area. In the early days among the names of important visitors were General Smuts, Lord Haig, John Galsworthy and Mr Horatio Bottomely. Of particular interest was the well equipped clinic, specially set up to deal with the employees, many of whom had lost limbs and needed specialist treatment. 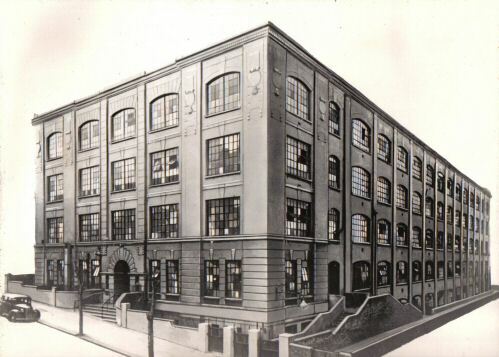 The factory was acquired by Hove Machine Tool manufacturer CVA in 1945. CVA had expanded in the post war period, and the old diamond works was one of a number of factories they acquired in the Brighton area in the 1940’s and 50’s. CVA used the factory for a number of its departments, and was home to many projects, fractional horsepower motors, drill chucks, lathe chucks and surprisingly domestic appliances. The domestic appliance venture came about due to the forethought of Eric Aron, who had been the Managing Director of CVA since 1933. Following the Second World War, Eric Aron felt that there would be a war surplus of machine tools, that would flood the market, and he looked to diversify into other markets. Because the likes of Hoover and other domestic appliance manufactures had been engaged in war work, their production lines had been dismantled. He felt that if he could get into this market quickly, he could obtain a significant portion. Two main products were manufactured at the Coombe Road factory, the CVA Columbine vacuum cleaner and the CVA electric iron. The Company did have some success with these products in the post war period, however they were based on pre war designs. As soon as the likes of Hoover got back into production, with new designs and new materials, CVA found it difficult to sell their products and production ceased. For many years CVA had worked with US manufacturer Kearney & Trecker Corporation. In 1966 Kearney & Trecker took controlling interest of CVA. Kearney & Trecker were innovators of computer controlled machines, many of which had been involved in the US space programme. Hi-tec machines required highly trained engineers, CVA had for many years had a good apprenticeship scheme, under Kearney & Trecker the apprentice training school was to have its headquarters in the old diamond works. In the late 1960’s and early 70’s up to 60 apprentices each year spent the second year of their four-year training in the Coombe Road training school, under the watchful eyes of the instructors, Mr Bob Mann, Gill Percy, Tom Muggeridge and Ron Poulton. These instructors had between them well over 100 years of engineering experience to pass on to the young lads! CVA centralised all operations to Hollingbury in the early 1970’s. In 1973 the Coombe Road factory closed and the training facility was moved to Hollingbury. For many years the old diamond works was almost derelict, at one point it was used to store car tyres imported from abroad. More recently, after a complete renovation, the old diamond works is home to The Big Yellow Self Storage Company. What an interesting article. I remember the CVA on this site, but I had no idea about its earlier history. I think the architecture of this building, as well as that of the old Dentsply opposite, are both beautiful in their own right. Well done! I wonder if anyone who worked for CVA has any stuff like manuals for the toolroom lathes? I have one – it’s 50 in July. I worked at Dentsply for 23 years, from 1957 untill 1970, as a mould cutter and later as a member of staff on the moulding floors. Growing up on Milner and Kimberley roads, I was always fascinated by the Tyreco and Dentsply buildings . They are very beautiful buildings and stand sentinel over anyone walking into the area up Coombe Road. I was very annoyed when an awful building was built on the site of the petrol station, obscuring one of the factories and breaking up their visual harmony. Another visitor to the Bernard Oppenheimer Diamond Works, on 1st February 1921, was the Prince of Wales. The Prince of Wales, eldest son of George V, firstly unveiled the Chattri on the Downs behind Brighton. This is the WWI memorial to the Hindu and Sikh soldiers who died in Brighton where they were receiving treatment for injuries received during the fighting. The Royal Pavilion was used as a hospital, but cremation of those who died was held high up on the Downs. The Chattri was built on the very spot where the cremations took place. Following the visit to the Chattri, the Prince of Wales went on to visit the Bernard Oppenheimer Diamond Works for disabled men. I was in the first Apprentice School in January 1953 and stayed there for 18 months but it was in Portland Road. Apprentice Master was John Adfield, assisted by Gil Percy. At that time, Tom Muggerige was Foreman on the Capstans in E Block. It was an excellent grounding and the benefits I got from there stood me in good stead all my working life. Henry Craddock was General Manager and took a keen interest in the Apprentice School. My brother worked at Dentsply. His name is Pat Dowds. Does anyone remember him? I enjoyed Doug Valeriani comments. I was in the apprentice school at Portland Road during 1956. John Adfield and, I think, Gil Percy were our instructors. Henry Craddock had overall oversight of the apprentice school. Tom Muggeridge was in charge of the night shift on the capstans, when I did my 6 months on that section during 1958. I remember being put on the bench when I joined in 1956 and given a 6″ file and hacksaw(which I’ve still got), both being deducted from my first weeks wages. I then spent at least 6 weeks filing, filing and more filing making one piece of metal fit into another. It gave me a good grounding which still stands me in good stead. Happy days. I have fond memories of the Kearney & Trecker Number 3 factory in Coombe Road. I spent most of the second year of my apprenticeship in the training school there. Having to instill knowledge and discipline to a bunch of 17 and 18 year olds sounds like it may be a tough ask, especially when dangerous machinery was involved. With Gil Percy and Tom Muggeridge running the training school, the apprentices had a wealth of engineering and life experience guiding them. The training school was on the second floor of the building, other departments were sheet metal dept, panel shop, fibreglass/plastics forming dept and there were lots of spare parts stored around the factory. The ceilings were not too high and the upper floors were full of natural light plus we were close to the fish and chip shop, the café, the newsagent and the pub. I was there when the factory closed in 1973; all the departments were moved to Hollingbury to what seemed a cavernous place with several hundred people working there, it was a big change from the 60 or so workers and the local community at Coombe Road. Viv, you may well be correct about the Coombe Road building (shown in the photo) being used by Allen West in the 1930s. It was, however, originally opened 1918 as the Bernard Oppenheimer Diamond Works, and was acquired (perhaps from Alan West) by CVA in 1945 and used by them up until 1973. My father worked for C.V.A, also Kearney and Trecker for many years on night work in the hardening shop as he called it. So did my uncle. I don’t expect there’s anyone around now that remembers them. My dad Charlie Newman and Ernie Standing, they worked at the Portland Road factory; I also worked there. We were at Coombe Road, then some of the women were transfered to Portland Road. The men there didn’t like us women working there because it was an all male work force. Kathleen, Ernie’s surname was Standen, my grandfather. You are my mum’s cousin. Using old commercial buildings as self-storage is becoming quite popular. Re-use is very eco- friendly. For example, further up the road in Lewes opposite the train station – the old sorting office is now self storage space (www.selfstoragespace.co.uk/lewes). I worked at Allen West during the War when it was a Munitions Factory. Women took the men’s places. I worked a Capston Machine, and I also worked in the Assembly room until after the war, when the men came back. Further down there was a comment made, hitch took my eye. The name mentioned was, Standen. My Mother’s maiden was Standen. It’s a long story, but I just wondered if it was any relation to the Standens who lived in St Helens Road Brighton? Ruby. However, the cutting I have seen from the Gazette does not refer to the opening, but the relevant issue needs to be read in full. The opening date does tie in with the years of construction, though. More work is also needed regarding the fate of the diamond processing operations, since The Brighton Season for 1921-22 gives the strong impression that they were short-lived: ‘Lord Roberts’ Memorial Workshops and the Diamond Works, both of which he [the Prince of Wales] visited, and took the greatest interest in, are now closed down to the splendid men who, disabled and shattered by the war, looked to these institutes as a means of making a living.’ If I find further relevant information on this subject, which is more complicated than it first appears, I hope to be able to supply it. Hi Douglas, CVA occupied the building on the south side, and the photo show is looking south east.